Down south we like to make things comfortable. It doesn't get any better than home-style chicken thighs smothered in gravy with a buffet of Momma Merrick's fixins. Smothered Comfort™ features whole, slow cooked chicken thighs that have a soft texture that can be easily broken apart by hand or fed whole. If you hear your dog yelping a loud thank you on the back porch, this is completely normal behavior. No matter the color of your state the Merrick Family says go Red, White and Blue! 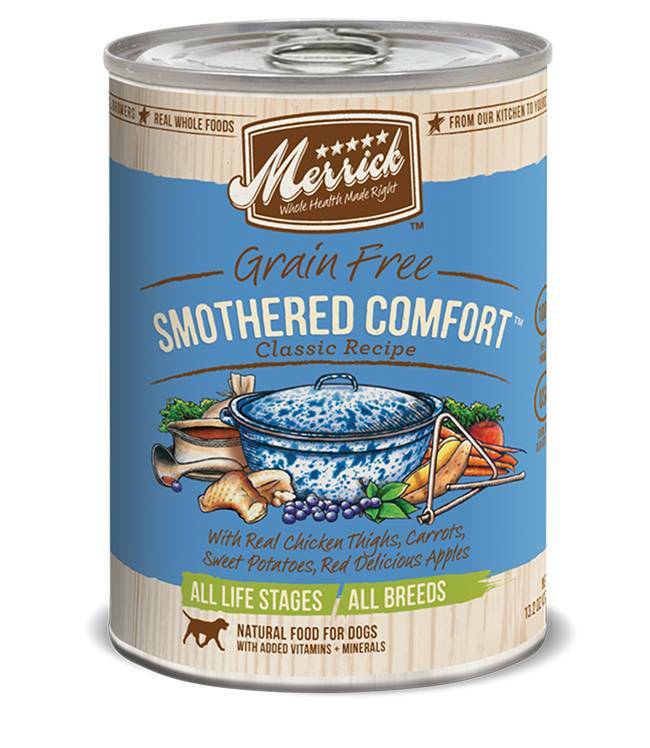 Merrick Classic Grain Free Smothered Comfort™ Canned Dog Food contains no artificial colors, flavors or preservatives. It contains delicious home-style chunks that your dog will love. Chicken, Chicken Broth, Chicken Liver, Carrots, Sweet Potato, Apples, Peas, Potato, Dried Egg Product, Natural Chicken Flavor, Carrageenan, Calcium Carbonate, Potassium Chloride, Vitamins (Choline Chloride, Vitamin E Supplement, Vitamin B12, d-Calcium Pantothenate, Vitamin A Supplement, Niacin, Vitamin D3 Supplement, Riboflavin, Pyridoxine Hydrochloride, Folic Acid, Biotin, Thiamine Mononitrate), Guar Gum, Salt, Sodium Phosphate, Cassia Gum, Canola Oil, Olive Oil, Flax Oil, Minerals (Zinc Amino Acid Complex, Iron Amino Acid Complex, Manganese Amino Acid Complex, Copper Amino Acid Complex, Potassium Iodide, Cobalt Glucoheptonate, Sodium Selenite), Thyme, Sage, Rosemary, Citric Acid, Yucca Schidigera Extract, Lecithin.